Swapna Haddow is the author of the popular Dave Pigeon series, but this book is nothing like those funny and cartoony books. This is a serious story about helping, and responsibility, and the illustrations are gentle for this more sensitive story. Alison Friend is experienced at depicting animals in social situations, and her soft style matches well. 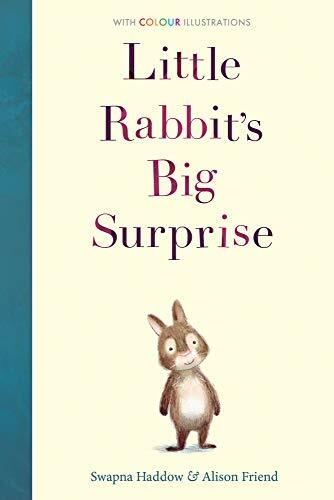 Little Rabbit is too small to help with the chores which mean that her Mum and brothers and sisters are busy, and Mum suggests that Big Rabbit will take her to play with Little Mole and Little Hedgehog. However, Big Rabbit knows that they are out with their families collecting dinner, so he suggests she accompanies him in his work. Little Rabbit is astonished to hear the word ‘work’ as she thought he lay around in the sun all day with his friends, but off they go. They find animals who need some kind of help, and they are able to provide that help. Little Rabbit is even able to add an idea of her own in helping Squirrel with his family responsibilities. This is not a picture book as such, as it is small like a chapter book, but each page looks like a picture book with a lot of Illustration and usually not much text, though a few pages contain two short paragraphs. It’s quite a long story, and would probably be read in stages for, or by, the child for whom it is intended. It might be tricky to find the right place for it in a library, but it is a charming little book.